Exhaust Band Clamp, V-Clamps, and other Exhaust Clamps. Selecting the correct clamp for your exhaust system. Trying to find which exhaust clamp you need? Choosing between an exhaust band clamp, u-bolt exhaust clamp, or V band exhaust clamp can be confusing. Whether you are repairing or replacing your exhaust system, at some point in time you are going to need exhaust clamps. This short guide should help you decide which clamp is right for you. Exhaust Band Clamp- The best way to connect two exhaust pipes. The band clamp is designed to "stretch" around the two pipes, creating an excellent seal. These clamps are available in most sizes, and normally come in one of two designs. The best design has a block between the ends of the clamp, you just tighten the clamp until it bottoms out on the block and you are done. The cheaper clamps have a piece of foil that you install between the ends of the clamp before it is totally tight to seal the clamp joint. 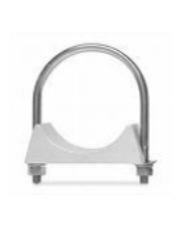 These clamps come in aluminum or stainless steel, so make sure you order the style that best suits your needs. U-bolt Exhaust Clamp-A very standard and cost effective clamp. The u-bolt clamp is designed to "crimp" the pipe when tightened to create the seal. These clamps normally break when you remove them if they have been on the exhaust system for a while, so it is best to not plan on reusing them. One strong point of the U-bolt clamp is that oftentimes after the clamp is tight, you can use the excess threads to fasten to a bracket to support the exhaust system. V Band Exhaust Clamp-Also known as a "Turbo Clamp", these exhaust clamps have an angled groove built into them. The groove is designed to "seat" around the flange on the turbo exhaust housing and the flange on the exhaust pipe. 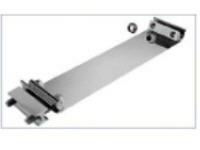 Although many universal V Band Exhaust Clamps are available, they are different in design. The most obvious difference is the diameter. Measure the flange on your exhaust pipe to get the correct size. Another difference is the width and angle of the groove. Most times, if your diameter and groove width on the new clamp are correct, the angle will be fine.